These Cauliflower Cheese and Bacon Fritters are the result of the OBSESSION that I currently have with all things Cauliflower thanks to pregnancy cravings. I’ve been experimenting with a few different ingredient combination but have to admit these ones are my favourite. 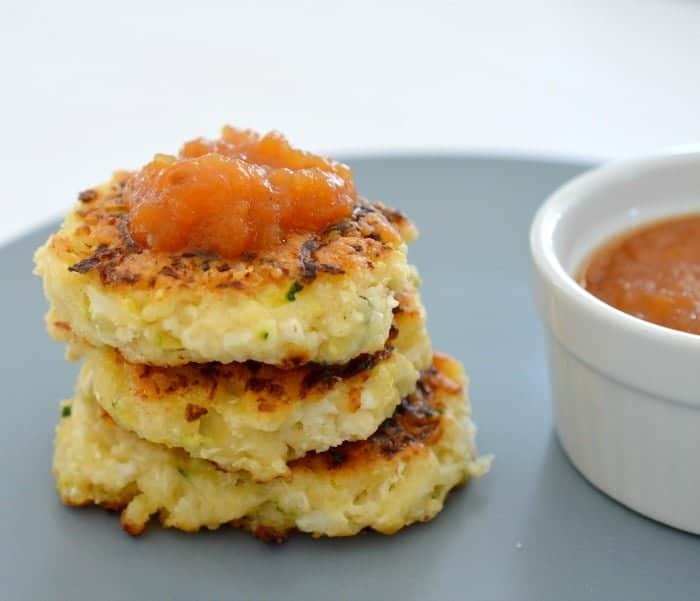 Although these contain both cauliflower and zucchini, they aren’t all that healthy thanks to the addition of finely chopped bacon and a whole lot of cheese. You can cut back on the cheese and omit the bacon (try adding corn kernels instead) for a healthier option. But hey, if you can’t indulge a little during pregnancy, when can you?? I also think they are definitely better for me than my other lunch favourite – Chicken, Cheese and Pesto Quesadillas! Such is my obsession with these, I’ve been making at least one batch of them a week and thankfully my local fruit and veggie shop has been selling cauliflowers for between $2.50 – $4.00 which is MUCH better than the $7 cauliflowers I’ve also seen around. 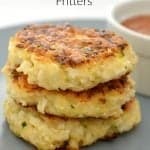 If you don’t have quite enough cauliflower when making this recipe, just cut back a little on the water you add at the end. I’ve made it with varying amounts of cauliflower, ranging between 550 – 700g and have used between 1/2 a cup to 3/4 of a cup of water each time. The mixture is quite wet at the end, but as long as you let the Cauliflower Cheese and Bacon Fritters cook for 4 – 5 minutes before flipping them, they will stay together. You can also pop any leftovers into the freezer for another time (haha!) and simply reheat them for around 10 – 12 minutes on 190 degrees. 600 g of cauliflower leaves removed and cut into small florets. 4 rashers of short cut bacon cut into small pieces. Add the crushed garlic, onion flakes, grated zucchini, chopped bacon, parmesan cheese and tasty cheese to the bowl with the cauliflower and add the self raising flour before stirring well to combine. Beat the eggs in a small bowl lightly with a fork and add salt and pepper to taste. Add the eggs along with 1/4 cup of water to the bowl with the cauliflower mixture and stir. 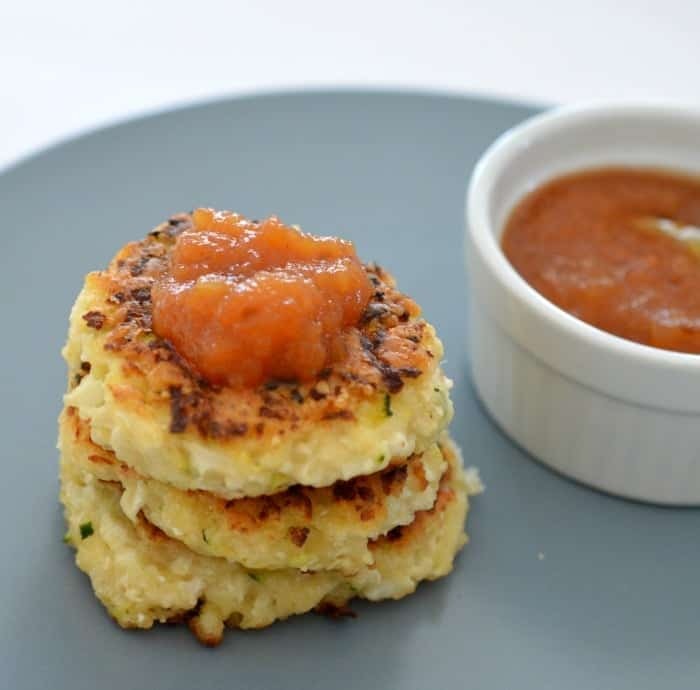 Gradually add the extra water and stir until you have a thick batter - please note you may not need all of the water depending on the size of the cauliflower and zucchini that you used. Heat a tablespoon of olive oil in a large frying pan over a medium to high heat and use a 1/4 measuring cup to scoop up the batter and place the fritter mixture into your pan. Use a spoon to gently spread the mixture into a circle between 1/2cm - 1cm thick. You should be able to fit approximately six fritters (or even more depending on the size of your pan) into your frying pan. Cook the Cauliflower Cheese and Bacon Fritters for 5 minutes on each side until they are crisp and golden brown before transferring to a plate and covering them with foil so they stay warm while you cook the next batch. Repeat until all the Cauliflower Cheese and Bacon Fritters have been cooked. Place the parmesan and tasty cheese which has been cut into 3cm chunks into your Thermomix bowl and mix for 7 seconds on speed 9 to grate. Transfer to a separate bowl until needed. Without washing the bowl, add the Zucchini (which has been cut into 3cm pieces) and bacon into your thermomix bowl and mix for 4 seconds on speed 6. If you would like it cut into smaller pieces, mix for a further 2 seconds. Transfer to the bowl with the grated cheese. Without washing the bowl, add the cauliflower florets, garlic clove and onion flakes to your Thermomix bowl and mix for 7 seconds on speed 8 or until they resemble rice. If there are still large pieces in your Thermomix bowl, scrape the sides and blitz for a further 3 seconds on speed 6. Add the grated cheeses, bacon and zucchini, along with 2 eggs, 300g of self raising flour, and HALF a cup of water to your Thermomix bowl in that order – please note you may not need all of the water depending on the size of the cauliflower and zucchini that you used.. Mix for 15 seconds on speed 4 REVERSE to combine the ingredients. Scrape down the sides of the bowl and if your mixture is still a little dry, add the remaining 1/4 cup of water and mix for a further 15 seconds on speed 4 REVERSE or until combined. For more simple and delicious Cauliflower recipes, check out my collection of easy Cauliflower recipes. Looking for more savoury ideas? Grab your copy of Snack Attack, available in both regular and Thermomix versions from our eBook store. I love all things cauliflower too!!!!! These look amazing!!!!!!!! I am definitely going to make these – yum! OMG! hun these look and sound fabulous! The best combo of flavours how great is cauli, cheese and bacon? We do a quick pasta with the same favours and its the bomb. I can totally understand why your whipping these up regularly! My kinda yumness hun. What a great recipe this is. I know someone that would love them ( and think they are healthy). They were soooo yummy! Thanks for great recipe. What is the sauce u have in the picture??? Hey Lauren, approximately how many grams of Parmesan & tasty cheese is required for this recipe? Thanks so much. Hi Lisa, I use around 100 – 120g all up. So around 70 g of tasty and 30 – 50 of parmesan. 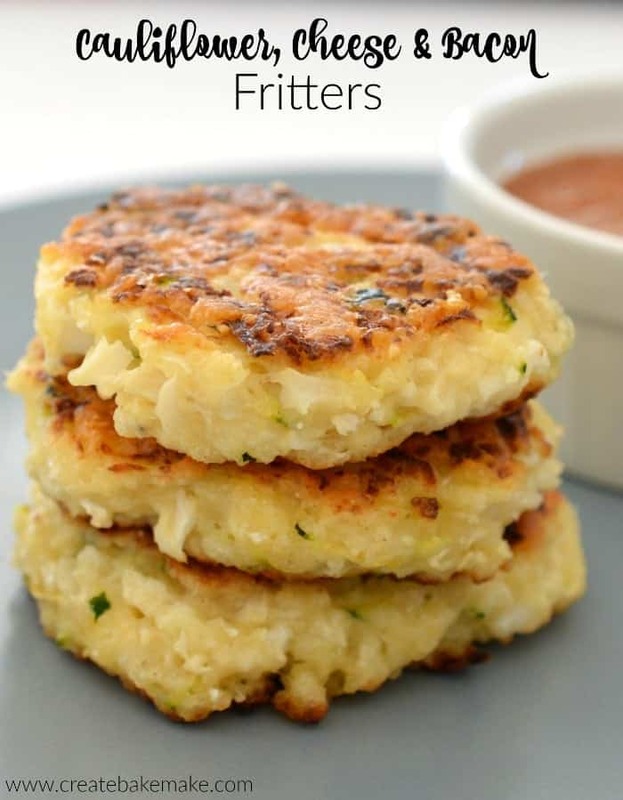 Can you freeze these fritters? They were so yummy, the whole family liked them. Do you think these would work without cheese? Dairy intolerant toddler on my hands! Hi Sharnni, I haven’t tried them cheese free but they should be ok. Maybe you could add another egg to help it hold together? It would be great to have the ingredients in thermomix friendly format directly above the thermomix version of the recipe. How do I figure out how much a cup of grated Parmesan is before I grate it? Lauren you can try screen print (next to the F12 button on your keyboard Look for where the recipe is located that includes the picture click Screen print find the saved image on your PC and edit out the unwanted parts of the screen print and save and print the resulting image. I’ve been doing this for years with web images that I couldn’t print or save. What exactly is “Tasty” cheese? Would you please share the recipe for the sauce you are showing in the Photos? Scrumptious!! Thanks for sharing such a delicious recipe. This recipe has now overridden my previous trusted fritter recipe! The fritters turned out beautifully and were so yummy! I added a small finely diced onion, a small finely grated carrot and replaced the water with milk – yummm!! !